A new documentary film looks at how climate change is affecting Arctic ecosystems. Between Earth and Sky-Climate Change on the Last Frontier was created by scientists. Executive producer David Weindorf is a dean at Texas Tech. 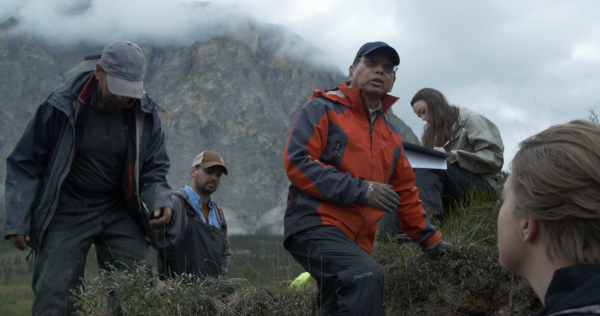 He said bringing students to the edge of ANWR to examine arctic soils was life changing for them because the remote arctic places was no longer an abstract place on a map. “They got to see how the pipeline and mining exploration are impacting the land surface in Alaska so I started bringing students up every year,” Weindorf said. Weindorf said Arctic soils are rich and deep with organic material, something that isn’t seen in Texas. The students studied the differences between the stunted growth of black spruce on the northern side of the slope where permafrost is prevalent. “Whereas on the south facing slopes you typically don’t have permafrost, there’s more solar radiation there, keeps things warmer so seeing that kind of dichotomy, going around the slope, one side to the other, you can see tremendous differences in the soil profiles in Alaska, it was just dramatic to see that,” Weindorf said. Weindorf said the scientific changes he’s observed in the arctic over the last decade are striking and the interviews he conducted with Alaska Natives and other Alaskans back up what the science reveals. “We felt like that was a really important piece of the film, to go to Kotzebue and Shishmaref and Nome and those areas that are really on the front lines of these changes, and hear from those people and how that science is impacting and their everyday lives,” Weindorf said. Weindorf said he wants the film to be educational for people in the Lower 48, saying the film has no other agenda than scientists documenting the truth about a changing climate. Between Earth and Sky-Climate Change on the Last Frontier will show on Sept. 29 at the Bear Tooth Theater in Anchorage and Sept. 30 in Palmer.